Comrade fighters, commanders and political workers, heroic defenders of Stalingrad! and the Volga over mountains of dead bodies of their own men and officers. decisive importance for the whole Soviet front. strength and weaken our own forces. for Stalingrad, for our great country ! Death to the German invader! Order nr. 4 to the Forces of the Stalingrad and South-west Fronts was a copy of Order No. 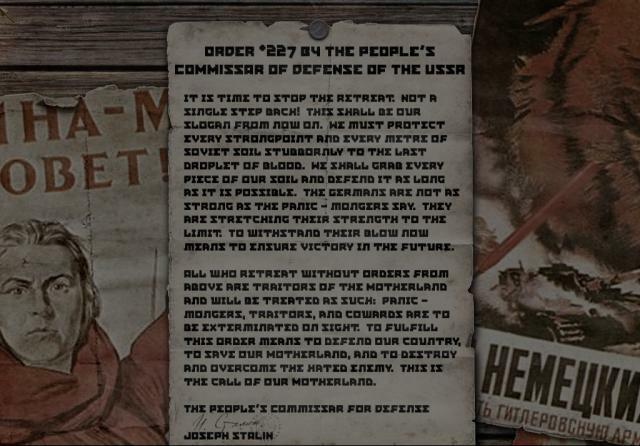 227 of July 28, 1942 that was issued by Joseph Stalin acting as People's Commissar of Defence. It is famous for its line "Not a step back! ", that became a slogan of Soviet antifascist resistance. No commander had the right to retreat without an order. Anyone who did so was subject to a military tribunal of the corresponding seniority level. Order No. 227 established that each Front must create 1 to 3 penal battalions (штрафбат, штрафной батальон, shtrafbat, shtrafnoy battalion) of soldiers accused of disciplinary problems, which were sent to the most dangerous sections of the front lines. Each Front had to create penal companies for privates and NCOs. From 1942 to 1945, 427,910 soldiers were assigned to penal battalions. The order also directed that each Army must create "blocking detachments" (barrier troops (заградотряд, заградительный отряд)) which would shoot "cowards" and fleeing panicked troops at the rear. Both measures were cited in the preamble of the order as having been successfully used by the Germans during their winter retreat. 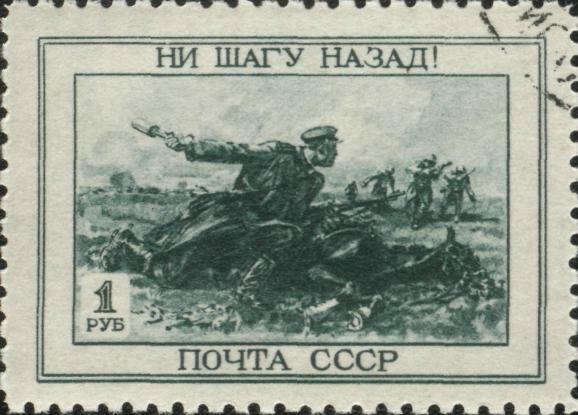 Russian war stamp "Not one step back! The requirement for Armies to maintain companies of barrier troops was withdrawn after just three months, on October 29, 1942. Intended to galvanise the morale of the hard-pressed Soviet Army and emphasise patriotism, it had a generally detrimental effect and was not consistently implemented by commanders who viewed diverting troops to create barrier units as a waste of manpower, so by October 1942 the idea of regular blocking units was quietly dropped. By 20 November 1944 the blocking units were officially disbanded.